AllBoat Services has a fully mobile team of professional marine electricians that can come to your boat. We specialise in sales, installation and fault finding on electrical systems. Our services are offered on various types of boats. Whether your vessel is a classic wooden sailing yacht or a modern GRP motorboat. We can accommodate all your requirements from fault finding to a full rewire and refurbishment. All work is carried out to current marine professional standards using only the best quality marine grade components and cabling. AllBoat Services have been chosen by equipment manufactures & suppliers including Dockmate, Sleipner Side-Power, Halyard and H+B Technics to be there approved dealer, supplier and installers in the UK. We are also authorised installers and applicators for Propspeed and Maddox Anodes, used to protect your equipment from electrolysis and fouling. We are uniquely placed to assist boat owners, whether it be for routine seasonal maintenance, repairs or refurbishments. We deliver the very best services for all types of craft. Our experienced team will assist you every step of the way to ensure that your boat is repaired and maintained to the highest standard and within budget. We offer good sound advice and consultation on the most suitable type of repair, materials to be used and timescales. We are well known to major insurers and as we have a long history of working closely together. As an established company we are trusted to give honest and accurate estimates, which help minimise the time for the works to be completed. From cutlass bearing to engines, anodes to electrical rewires we’ve got it covered. Our flexible working ethic means we can bring all our services to you boat where ever she is lying. Carrying out our work with full empathy to the boat is important to us. We aim to make the installation look as if it were an original boat build installation. Utilising our experience we carefully match the cabling, breakers, labeling and paneling, complementing the existing boats systems. From an extra socket to a full rewire we’ve done it all. Customer installations include, Lighting, Solar panels, Air-conditioning, Battery Charging & Battery Distribution. We supply and install Inverter Systems, Bilge pumps, Fire detection, Hydraulic platform lifters, Generators, Bowthrusters, Docking systems, Power distribution, watermaker. Bowthrusters, Sternthrusters & Boat Stabilizers are our passion and we are extremely proud of our long association with the Sleipner Side-Power products since the early 1990’s. The Side-Power range of equipment is the market leader and are the boat manufacturers installation choice. Allboat Services specialises in the installation of Sleipner Side-Power equipment, working closely with the manufacturer and customer to produce a bespoke system of the highest quality. We offer a mobile installation team with highly experienced marine engineers and fabricators. We understand what is involved with all aspects of an installation from getting the technical installation correct to managing the customers’ expectation. Bowthrusterdirect.com are part of the AllBoat Group and we have installed Sleipner bow & stern thrusters and stabilizers into GRP, Wooden, Steel, Aluminium and Composite boats. We understand the subtleties and technical differences of these construction types and materials used. Batterycablesdirect.com are part of the Allboat group and was set up to meet the growing demand for quality bespoke cables, supplied at reasonable prices. To meet these demands Battery Cables Direct set up an online mail order service to deliver the products direct to the customer’s door. Since its launch we have relocated our production to a purpose built unit and all our cable are assembled in house. We offer a fast, reliable and efficient service. Our online shop is easy to follow and order from and you will find our staff both courteous and helpful. We have a wealth of practical, hands-on experience. If you unsure of what you require you can draw on our technical knowledge, this support extends to our online ‘Live Chat’ support. Electrics and cables are our passion and whether its supply only or supply and install we’ve got it covered. With Dockmate you can now manoeuvre your ship from any place on board thanks to the DOCKMATE wireless control system. You can flawlessly operate two motors, horn, bow thruster, stern thruster and windlass with the tips of your fingers. The DOCKMATE is a wireless extension of your engine controls while maintaining the exact feeling e.g. response time of the gearbox and of all the accessories mentioned above. This system allows every skipper to dock their boat single-handed. Done with uncertainties; how far am I from the jetty? According to the crew, often more than one meter, in reality 30 cm only, or vice-versa. Our unit will pay for itself in a relatively short time by not sustaing damage. You know how much fixing a scratch or, worse, a crack in your ship costs. It can also replace a winch or muscle strength when mooring, we let our own boat do the work through our DOCKMATE to tighten the ropes. Dockmatedirect.com are part of the AllBoat Group, we work very closely with Dockmate and our combined knowledge of single handed docking system is unrivalled. Whether you’re looking for supply only, we are happy to hold your hand and guide you through you installation or supply and installation by ourselves, we offer the full package. Lead Crystal Batteries are high performing batteries. They have a deeper discharge and can be cycled more often no matter the temperature. They have a much longer life compared to your normal lead acid, and lead gel and SAM (Super Absorbent Matt) batteries. We believe that Lead Crystal Batteries are the better alternative to lead acid, lead gel and SAM batteries. Now you are able to choose what is best for you. Lead Crystal Batteries are being used in all industries where conventional lead based batteries like lead acid, lead gel and SAM batteries are used. The industries that have discovered the benefit of using Lead Crystal Batteries are telecomunications, ups, petrochem/marine, defence, renewable energy, health care, manufacturing, transportation and electric motion (wheelchairs, golf carts & trolleys). Lead Crystal Batteries are better for the environment because they use less acid, no cadmium, no antimony. They are up to 99% recyclable, hopefully this will become 100% very soon and they are classified as non-hazardous goods for air, sea and land transport which makes supplying to you easy! Together with H+B Technics we are proud to say that many well-known boat and yacht manufacturers have appreciated the high quality, strength and durability of our products for almost two decades now. Platformliftersdirect.com are part of the AllBoat Group and we are able to supply and install elegant solutions for launching and lifting your Dinghy’s, Jet Skis and other heavy equipment. It offers you complete hassle free freedom to go off and explore otherwise areas that you thought would be impossible to get to. Hydraulic lifting units are placed under platform which submerges the platform under the water’s surface. There are no beams or davits disturbing head clearances and no obstacles obstructing space on the stern and platform of the boat. Whether you’re looking for supply only or supply and installation we offer the full package. With the ever changing ocean, it is vital that you ensure that your boat is protected sufficiently with good quality anodes and bonding systems if you are travelling far and wide. We are very proud to work with Marine Protection Systems who offer innovative and effective products that offers complete protection for your boat whether it be wooden, stainless steel, aluminium or GRP. Maddoxanodesdirect.com is part of the AllBoat Group and in partnership with Marine Protection Systems our specialty corrosion protection products include the Electrolysis Blocker™, Maddox™ anodes and the unique Shaft Grounding Strap. Marine Protection Systems also represents brands of products for the protection of engine and equipment from vibration, mooring and docking solutions and premium paint systems. We can design a protection system unique to your boat comprising of anodes, electrolysis blocker, and shaft grounding strap. We can then supply or supply and install the system to meet all your protection needs and give you peace of mind. Metalstyle has combined its exceptional steel and aluminium processing skills into one unique brand. Thanks to a perfect blend of high-technology and masterful craftsmanship, Metalstyle is capable of offering shipyards, architects and ship-owners a wide range of high-level and highly-diversified products tailored to meet the needs of any project. These include: airtight doors and hatches in stainless steel or aluminium; RINA certified door models capable of withstanding a 3m head of water. MED certified A30 class fireproof doors plus a wide range of furnishing accessories, including rudders, table supports, chairs, pilot seats, control stations and bar stools, as well as many other sophisticated items which take the finish of your boat to another level. They are pleasing to the eye and demonstrate a very high quality. Metalstyledirect.com are proud distributors and installers of the Metalstyle brand & products. 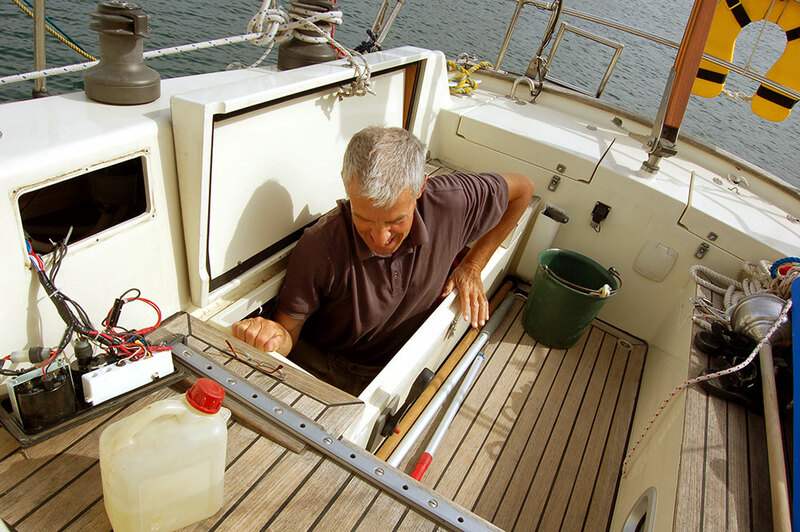 Whether you’re looking deck hardware or watertight hatches supplied or supplied and installed, we offer the full package. Our customer brought his boat along the South Coast to us for an installation of a Sleipner Side-Power Bowthruster. I am the owner of the red rib which had the long crack in the hull. I wanted to thank you and your team for the great job. The repair is still holding after many hours at sea. All fitted and working like a caged Buffalo! So thanks for looking after me so swiftly, I wouldn't hesitate in recommending you both and Allboat Services. Thanks, Maria. Would you please pass on to Nick how much I appreciated he and his team looking after my little problems with such short notice. In particular having the stabilisers working made the return trip hugely more comfortable. Your service in this matter has been fantastic, without your input we would not have been able to complete this repair thank you for your support. Many thanks again for your brilliant advice. The Bow Thruster is definitely the best I’ve ever had in any boat over the years. It’s almost silent and a couple of times I have had to check it’s actually switched on as I cannot hear it in a strong wind.